Want to try dyeing things but don’t know where to start? A reader wrote me recently asking for help. Where to start, what to read? The easiest kind of dyeing to start with is food dye on animal fibers. I love this because you can do it in the kitchen with grocery-store items, the results are super-satisfying, and the kids can join in. What are animal fibers? Wool, silk, cashmere, you get the idea. You can do some beautiful things with Kool-Aid and wool, and IT WILL NEVER WASH OUT. 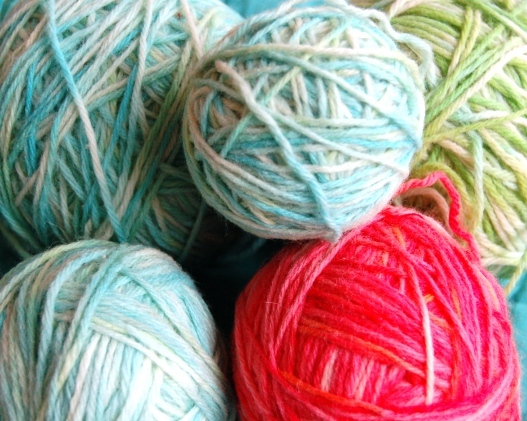 Kool-Aid (or Easter egg dye) and wool yarn is a perfect starter project, especially if you knit. You can dye it with a rainbow of colors, using your microwave. The yarn above was dyed with this method. Check out this article on knitty.com for details and instructions. Lion Brand makes an undyed 100% wool yarn called Fisherman’s Yarn that is very reasonably priced. I used to buy it at Hobby Lobby, but it may also be available at Michael’s and other craft stores. Knitpicks also sells undyed yarn, in a wider variety of weights and variations. Their prices are very reasonable also, but you do have to order it. Also try dharmatrading for yarns. You can dye pieces of old wool or cashmere sweaters in a similar way, but it’s a little tricky—-you should be prepared for uneven results. Here’s a project of mine with Easter egg dye on cashmere. I would recommend starting with a light-colored sweater and dyeing smaller pieces (an arm or less) at a time, as a sweater acts like a sponge to the dye, absorbing the color before it gets the chance to circulate around the fabric. The process is similar to the yarn-dyeing project, but use a larger amount of dye and a larger container, on the stove instead of the microwave. I used my big soup pot. The same process should work for wool and cashmere wovens, though I’ve never tried it. Kool-Aid, Easter egg dye, or food coloring also works well on silk. I’ve used it to make playsilks, with the directions here. I’ve also dip-dyed silk scarves, which you can see here. After heat-setting, these dyes are not quite as colorfast as in wool and cashmere, so I would recommend hand-washing. Even so, the colors bleed very little. Dry out of direct sunlight, or the colors will change. With any dyeing project, there’s a certain amount of risk involved. You never know exactly what your finished project is going to look like, and for me, that’s part of the thrill. Be prepared for that uncertainty, because even if your project turns out beautifully, chances are it won’t be exactly as you envisioned. For part two of this article, about dyeing plant fibers, click here. This entry was posted in Crafts, Fiber Arts and tagged cashmere, craft, dip dye, dye, Easter egg dye, fabric, fiber, handmade, kids, kool aid, recycling, scarf, silk, sweater, thrift, wool, yarn by Emily Smith Pearce. Bookmark the permalink. You are a veritible fountain of information.